Of malt whisky, cider and other drinkables. Carpe aqua vitae. 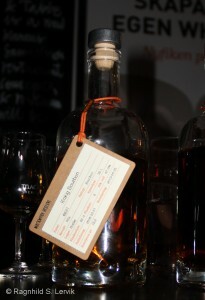 This edition of Preludium is from Mackmyra’s smoked newmake variety that has matured in ex sherry casks. 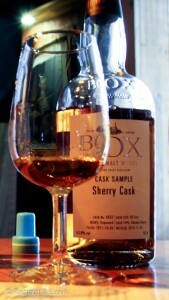 Nose: Malt, slight smokey character and liquorice. Water brings out fruit, both fresh tropical and something dried, possibly apricots. A somewhat sharp, young off-note is also present. Palate: Liquorice and a slight smokiness, but also a somewhat woolly, murky “chemical” feel. With water the liquorice is still present, but also raisins and some congeners. Comments: This is probably the best Preludium I’ve tasted, though that is not neccessarily saying much as my impression of the series as a whole is not very good (though I AM a fan of much of what Mackmyra has released in later years). Smoke and sherry does a lot to conceal any off-notes, so that even though this also has a “young and unfinished” feel, it’s far from undrinkable. Nose: Singed juniper wood and juniper berries. Lemon. Vanilla and coffee, and spices; chai? More of everything with water, but also chalk and mineral notes. Palate: A lot. Let’s see: Immediately a little burnt rubber and liquorice, then herbs and after a while oak planks and one the finish coffee. The chalk makes and appearance on the palate as well with water. Comments: I’ve poured a The Challenger in another glass to compare the two, and I still find Challenger closed on the nose. Explorer has more of a full in-your-face-nose. But they are both good. Very good, in fact. In six months the fourth and last bottling of The Early Days Collection will be released. I will be ready and waiting on the date of release, and once I’ve got it I will, of course, have a quadrupel paralell tasting. I’m already looking forward to it. Nose: Cold smoke and brick, malt and barbeque. With water it turns fruitier, but there’s smoke hanging over the whole. Palate: Smoke, barebeque and green grapes. Water emphasises the smoke. Comments: Nice, but a little one-dimensional. Best without water. 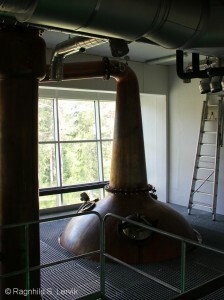 Mackmyra Midvinter has been finished in Bordeaux casks, glühwine casks and sherry casks. Which leads me to expect mulled wine, really. We’ll see. Nose: It definitely smells of herbs, and herb schnaps. Not quite Underberg, rather a sweeter version. Sweetness and Christmas spices, and a hint of toothpaste. There’s this odd (to me) toothpaste variety with cinnamon flavour; that’s what this smells like! More of that with water. With a lot of water some fresh fruit emerges, pears, perhaps? Palate: Toothpaste with cinnamon flavour is a pretty accurate description of the palate as well. Cloves and other Christmas spices also appear. Bitterness, oak and cloves on the finish. Water makes no noticeable difference. Comments: This is just plain weird. It’s not unpleasant as such, but it’s not “whisky”, and not quite good enough to convince me not to care. In contrast with the last couple of Mackmyras this one is not “förlagrad” (pre-matured). When the cask was filled on 28 May 2007 and the bottle filled on 15 November 2011 we’re talking about a straigh forward four year old whisky. On the other hand, it’s been matured in a 30 litre ex-sherry cask, which should give it a lot more cask influence than a four-year-old from a full size cask. Nose: Red berries, dried cranberries, vanilla and something port-like. With water it acquires a hint of liquorice, but also more fruit. Palate: Sherry, and raisins with a hint of cardboard. With water the cardboard transforms into bread dough, other than that the main impression is “sherry”. Comments: Decent, but nothing more. Better on the nose than the palate. So here’s another variety of the “förlagrad” (pre-matured) Mackmyra, for this one it’s three years in an ex-bourbon barrel, then three years minus one week in a 30 litre cask made from Swedish oak. 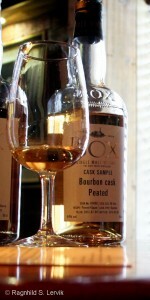 The latter is presumably a new cask, and would be expected to provide a lot more to the spirit than the pre-used one. 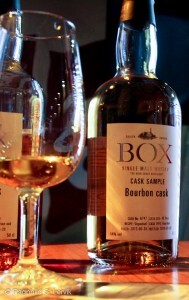 Nose: Vanilla and toffee. Tropical fruit in teh background, roasted nuts and garrapinyades (“brente mandler”). With water I still get the nuts, but also Four Red Fruits tea and oak. Palate: Oak, honey, thyme and heather. More oak. Oaky bitterness. A lite liquorice and dark syrup on the finish. Water increases the bitterness, but I also get fruit tea (fruit infused black tea) with atrificial sweetener, especially on the finish. Comments: Not my cup of tea (almost literally). Not horrible, but too… Well, too much bitterness and the sweetness that is there is not a balance, because it comes across as artificial. And I don’t like fruit infusion teas, so that’s a bit of a non-starter. When I set out to record the details for this cask, which Mackmyra brought a sample of to Östersund Maltfestival, I got confused. What do they actually mean by “förlagrad” (“pre-matured”)? When the label says that the cask was filled (“fatfyllning”) 30 June 2010 I’m assuming they mean filling of the 30 litre bourboncask which the whisky is then bottled from, but what, exactly, is being filled into this cask in 2010? How old is the spirit and what had it been stored in previously? A quick search, and I found that Mackmyra provide the answer on their cask offer pages. 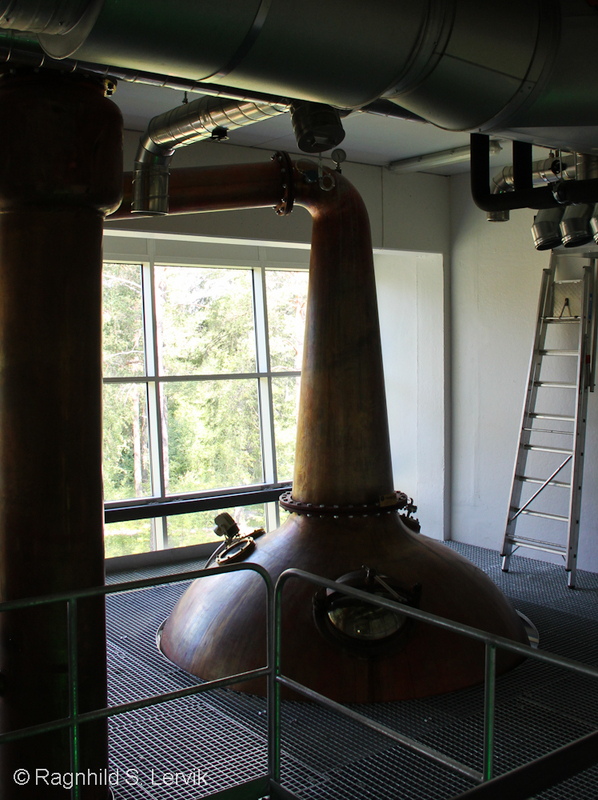 If you buy a cask from them, one of the spirit varieties you can choose is “förlagrad elegant”, which means that the spirit will first have been matured in a 200 litre ex-bourbon cask (i.e. a bourbon barrel) for three years before it is filled into your 30 litre cask of choice. In other words, it is already whisky by the time it’s filled into the tiny cask, and you would be justified in calling the extra maturation a sort of “finishing”. In any case, here are my notes for this specimen of Macmyra’s “elegant” (that is: not peated) spirit, matured for three years in a bourbon barrel and then for almost three years more in a 30 litre ex-bourbon cask. Nose: Vanilla, fresh herbs, gooseberries and tropical fruit. More oaky with water, and some sweetish spices; cinnamon? Palate: Vanilla, wood and oaky bitterness. Tropical fruit and a hint of coconut (pina colada!). Water tempers the bitterness somewhat and I’m left with vanilla, fruit and coconut. Comments: A very pleasant dram. A little too bitter on the palate, but nice even so. Filled 4 July 2012, bottled 6 February 2015, peating level 43 ppm, matured in a 40 litre ex-bourbon cask. 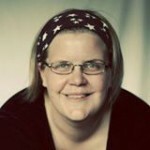 Nose: A bonfire that someone’s thrown some juniper branches on over which spareribs are being grilled. When I add water the sweetness and heat disappears and I am left with cold smoke, flint and juniper berries. Palate: Cold smoke, in contrast with the heat on the nose, lemons and herbs. No significant development when water is added. Comments: Wow, that’s a bit of a split personality on the nose. I liked both varieties, but preferred the hot and sweet undiluted character. The palate is perfectly fine and demonstrates how much can be disguised with a bit of peat, this they could easily bottle and sell as far as I’m concerned, something I wouldn’t advice doing with the unpeated variety. Another dram? Well, if you won’t need to twist my arm. 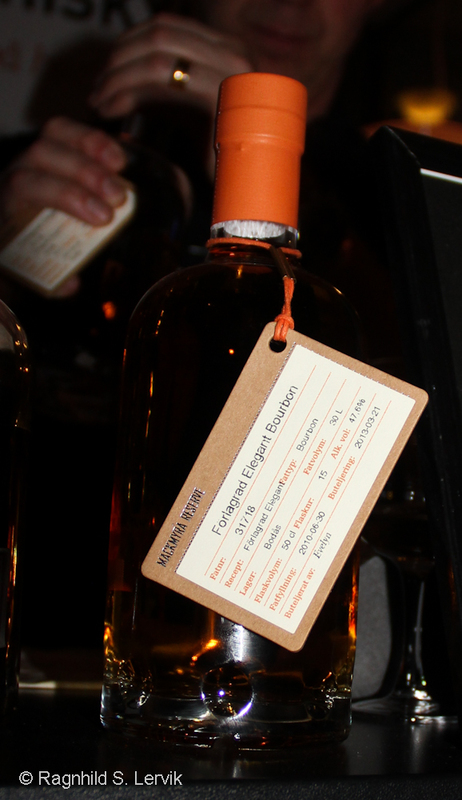 Filled 5 October 2011, bottled 29 November 2014, unpeated spirit matured in a 40 litre ex-oloroso sherry cask. Nose: Butterscotch, a lot of butterscotch. A little roasted grain. With water, rubber appears on the nose as well; warm car tyres. And a hint of black pepper. Palate: Burnt rubber, garden hose and a faint whiff of toffee. it’s all less intense with water, but the impression of chewing a garden hose lingers. Comments: WAY too much cask influence, for my palate. I’d MUCH rather have the adolescent congenners of the bourbon cask variety. It’s interesting to taste this, especially in contrast with the other, as it’s a text book example of cask influence making all the difference, but unfortunately it’s not a drinkable dram. 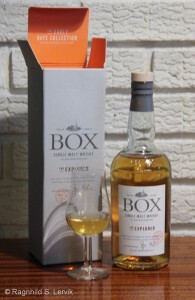 Filled 30 June 2012, bottled 8 January 2015, unpeated spirit matured in a 40 litre ex-bourbon cask. Nose: Cumin and pine needles, vanilla and some congeners. A little lemon with water, more congeners and black pepper. Palate: Black pepper, vanilla and spice, but also a little sulfur and congeners. The young age is emphasised with water, but the pepper stays, also on the finish, and I get some candied lemon. Comments: Young, but promising. Definitely appears unfinished, not really ready for drinking, but then the point of these cask samples is not to sell drinking whisky (yet).